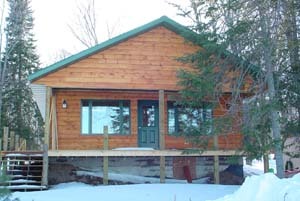 We have several cabins for rent in the winter. 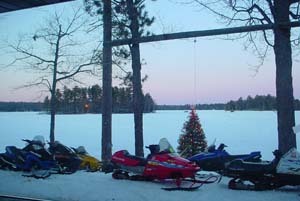 We are located directly on the snowmobile trail. Park your sled right outside your front door and you have access to hundreds of miles of the best groomed trail system in the country. Hungry, have one of our Izzyburgers, a 1/2 lb. sirloin burger, sure to tame the biggest of appetites. Also available are pizzas, chili and sandwiches. 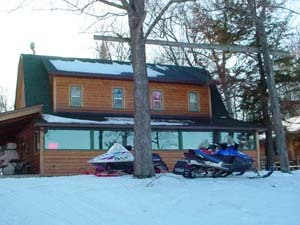 Gasoline is available when the lodge is open. 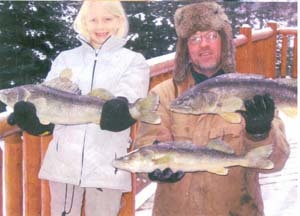 Spend some time ice fishing on Pioneer Lake - some monster walleyes are caught through the ice, as well as many other species.